It’s your story, your brand, thank you for letting us be apart of it! Anna DiGilio was a 2nd grade teacher for over 20 years. During that time she developed many resources that she sold through the Teachers Pay Teachers sales site. In 2016 she participated Stu McLaren’s Tribe program and decided to launch a membership site for 2nd and 3rd grade teachers where she would release new resources in 10 different categories each month. For this project she needed a sales site as well as a membership site integrated with a payment processor system that could handle recurring monthly and annual payments. Since her initial launch in January 2017, SimplySkilledTeaching.com has grown to over 6,000 members. While she offered monthly and annual membership options, the challenge has always been to retain members month after month, especially after Year 1. This project required a robust membership platform that could accommodate growth, was simple to maintain, and offered clear navigation for the members. In addition, she had a sales funnel that offered free content to let new prospects know, love and trust her so that when she opened her cart twice a year, prospects would take advantage of her membership offer. Discovery: Details about what exactly was to be offered, how and when were established. Planning: Anna decided she wanted to use her graphics designer to create the images used on the membership site to be consistent with her product branding. We had to determine the best WordPress theme and membership plugin to address the various membership levels she wanted. Since she had not taken payments for products we also had to determine a payment processor that would provide recurring subscriptions integrated with the membership plugin. She also realized that she would be using a few affiliates to promote her membership and needed a system to monitor those sales so she could process their payments. Because she was going to use a PLF (Product Launch Formula) style launch, we also decided all the pages, emails, tagging and launch dates needed to make her cart opening on January 1st. Design/development: All the membership pages were set up in WordPress with access controlled by the Wishlist Member plugin. The PLF-style launch funnel required setup of Infusionsoft campaigns integrated to WordPress sales and opt-in pages. Testing: Testing of all 4 membership levels was performed on a wide variety of desktop and mobile devices and browsers. Integration with the payment processor was also tested. Launch: Sales pages and their links were activated in accordance to the launch schedule. The cart was closed 7 days later and a “membership closed” page with an opt-in to find out when the next enrolment was set up and integrated with Infusionsoft. Katherine is a very successful Feng Shui consultant with private clients around the world. In 2014 she took steps to realize a life-long dream of launching a combination ecommerce, elearning, and membership website. For this project she needed a sales site as well as a membership site which included elearning concepts integrated with a payment processor system that could handle recurring monthly and annual payments. The biggest challenge was to establish learning objectives each month and provide the perfect volume of live and static content that would allow participants to meet the objectives and and yet not overwhelm them. As participants in program were in various stages in their career the platform had to provide value at a price point(s) that fit every one’s budget. This project required a robust membership platform that could accommodate growth, was simple to maintain, and offered beautiful and easy navigation for the members. In addition, due to the type of content being delivered, a custom integration with Pinterest was developed and a rolling content delivery schedule of weekly, twice-monthly, and monthly was developed. Planning: Katherine used her own graphics designer (who had worked with her for years) to create the brand and all the custom graphics used through out the site. Katherine was already using the Avada theme on her other websites so to eliminate the learning curve, we continued with theme and plugins the she was familiar with and still met her needs for this new platform. Additional and new features included an affiliate program, a referral program and a combination of live and static content delivery. Design/development: All the membership pages were set up in WordPress with access controlled by the Wishlist Member plugin. Content was organized around monthly learning concepts and twice-weekly “check-in” exercises. Depending on the monthly concept, addition content was made available. All content was delivered in “categories” to make it easy for the members to locate. Testing: Testing of all membership levels and content delivery schedules was performed on a wide variety of desktop and mobile devices and browsers. Integration with the CRM and payment processor was also tested. Launch: Sales pages and their links were activated in accordance to the launch schedule. The platform has an “open” registration so members can join at anytime. Elizabeth was a successful nurse, author, and speaker. 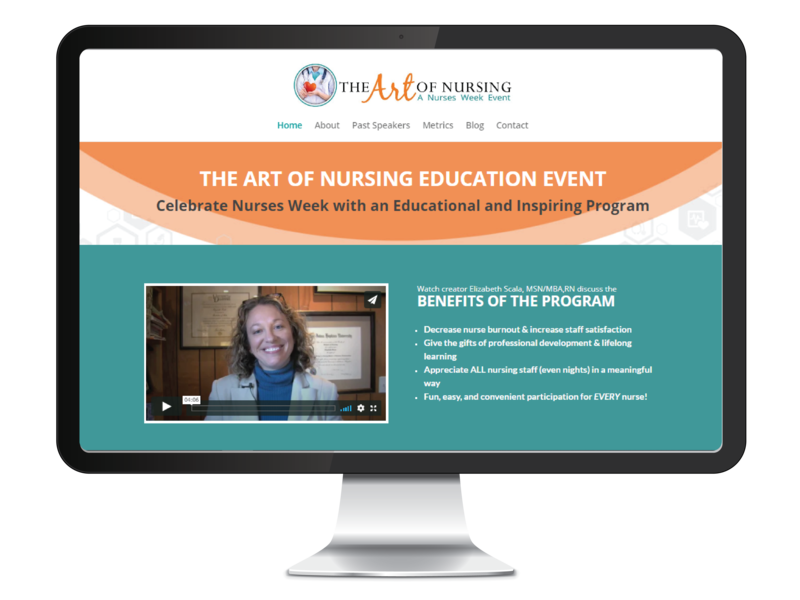 In 2015 she launched her first “Art of Nursing” online event to educate and support those working in the nursing profession. In 2016 (and 2017) we began working with her to develop a platform to grow and support the week-long event with an eye to being able to allow hospitals to host the event content in their our Learning Management Systems. For this project she needed a revamped sales site, a robust membership plugin and e learning system which would allow her to deliver the content live on her own platform as well as (in the future) export that content in a way that hospitals could deliver internally. The biggest challenge was to develop a platform and communication system that would in a stand-alone format and also be able to be integrated into existing hospital information systems. This project required a robust membership platform that could accommodate growth, was simple to maintain, and offered easy navigation for the members. The platform needed to scale as the annual event increased in content and participants. Additionally, the platform needed to be in a format that could be used within the technology platform of the various participating hospitals (if they chose to do so). Planning: The schedule for when sales and registration would open was revisted each year. As hospital purchased a license for the program, we would schedule a call with the nursing and technology departments to discuss their custom registration pages, the event dates, and confirm any security restrictions that may prevent the members from accessing content and receiving email communications. Design/development: The program was re-branded to give it a fresh and modern look. A format and content delivery schedule already existed and additional bonuses and engagement were added each year. All content was delivered through LearnDash and access was controlled by the Wishlist Member plugin. Individual clinical/medical personnel could purchase the program however, the program was targeted to hospitals. A “group licensing” program was developed to allow for hospitals to choose a license that fit the size of their organization. Testing: Testing of all membership levels and content delivery schedules was performed on a wide variety of desktop and mobile devices and browsers. Integration with the CRM was also tested. Launch: Sales pages and their links were activated in accordance to the launch schedule. We also provided post-launch support to deal with any registration, access and email discoverability issues..